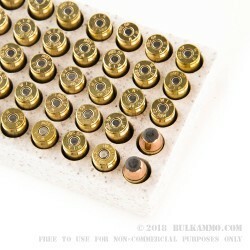 This is a 180 grain .40 S&W ammo that offers good functionality in a large variety of mainstream firearms and comes without lead in the primer. 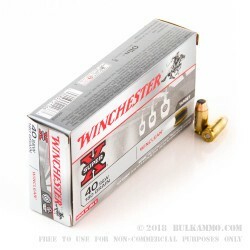 The benefit of this, paired with Winchester’s brass enclosed base projectile, is that no exposed lead comes in contact with hot gases, which can turn lead into airborne particulate matter that can cause a problem for the shooter both in irritability and in long term potential exposure. Another response to tightening lead mitigation regulations and changes in state and local laws regarding public safety with regards to lead exposure. Most pistol shooters never have a problem regarding lead exposure, but there is an unseen effect that can be improved and at the price for the range type ammunition offered by Winchester WinClean ammunition, it just makes sense to improve your overall shooting experience. 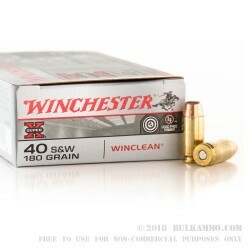 As an added bonus this 40 cal ammunition offers a very clean shooting experience which means reduced difficulty in cleaning your weapon after a range trip and a less smoky, more enjoyable trip to the range. 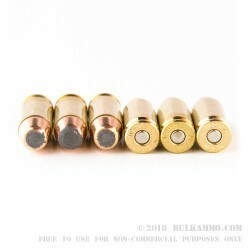 The real benefit of the round is that it is reasonably priced, accurate ammunition that functions in many firearms and it offers a clean, enjoyable shooting experience in indoor or outdoor shooting environments.